The final thrash of the year in the woods take place this weekend in the Lake District. It’s in Englandshire, but it’s a lovely part of the country and they don’t speak furrin, so it’s OK to visit. 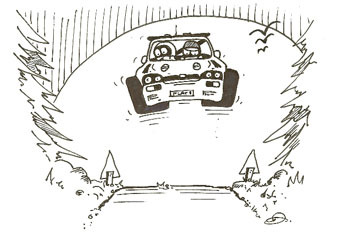 There are full details of Saturday’s Grizedale Stages Rally on its website with pdf maps and other info, so if you fancy travelling down have a look there first. The first car gets underway at 09:30 hrs on Saturday morning (8th) from Coniston and finishes mid afternoon at Skelwith Fold. There are 4 stages and quite a few spectator locations have been prepared for those who need their last forestry fix before hibernation sets in. They’ve also got a top quality entry to finish the year with a flourish. Quite a few of our lot are going down hence the interest. Jock Armstrong, John Wink and Michael Binnie are all in the top ten with Bruce McCombie debuting his new Ford Focus WRC seeded at 12. Further down the entry list are Robert Harkness and Walter Henderson. It will be Robert’s 2nd time out in 4WD having forsaken his BMW and Walter’s 2nd time out in his Mk2 since he gave up the Subaru. And there’s more, full entry list below.